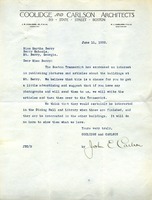 Mr. Carlson writes to Miss Berry saying that he cannot make excavation plans for the Recitation Building because he hasn't gotten the date yet. He says he will be at Berry on May 10th and will make plans after their meeting. He also says that he sees no harm in running an article about the dorm fire in Boston papers and asks her to send one or two photographs for the article. 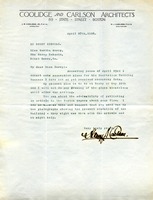 Henry J. Carlson writes to Miss Bonner to send her two or three lists, telling her that if they don't interest her he'll stop sending them.